Definition: Social responsibility is a set of activities carried out by an organization with the purpose of benefiting the society. Social responsibility or corporate social responsibility embraces those company actions that are assumed to impact society in a positive way and therefore do not have a direct “for-profit” drive. 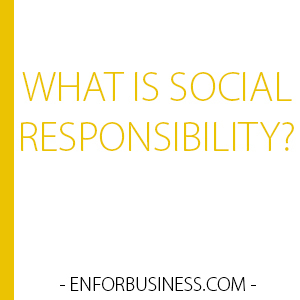 What Does Social Responsibility Mean? In today’s business world, companies are supposed to show sensibility toward social matters such as poverty, education, environment, health and so on. Besides their for-profit activities, firms are expected to engage in some kind of social endeavor. Although these activities are not profitable by nature, they are frequently considered an investment in reputation and corporate image. When deciding about a purchase or choosing certain brands, some consumers could be influenced by information about a company that develops an admirable social responsibility program. For employees, it is easier to identify themselves with an employer that engage itself in social projects on a regular basis. In practice, the way that companies are socially responsible varies greatly. Some firms make social responsibility an integral part of their profitable processes. For example, they can choose only environment-responsible suppliers or provide education programs to children of its less favored employees. Other companies might support third parties such as foundations developing social programs. For example, to devote certain amount of money into a social organization working with young orphans. McHamond Cereals is a company operating in the business of Ready-To-Eat cereals for children. The firm had not implemented any social responsibility program until the suggestion was made by a new manager hired for the Institutional Relations Department. After the recommendation, a new position was created to focus on social affairs with the purpose of building a positive company reputation. This job position covered the design of a coherent social responsibility strategy. After a few months, the company was in the news thanks to a new partnering with “Food For Kids”, a well-known social organization that gave free meals to children living in extreme poverty. McHamond would provide 0.3% of sales to the social organization with the aim of expanding its food distribution scope. In addition, employees would normally participate as volunteers in “Food For Kids” one working day per year. Due to this partnership, cereal packages would have a small “Food For Kids” logo in a corner so the brand would be permanently related to a highly positive work that benefits poor children.